I’m very pleased to report that SB 32 passed both bodies of the Legislature and will be sent to the Governor for his signature to become law. This legislation implements recommendations from the Alaska Timber Jobs Task Force and the Board of Forestry. In a nutshell, the Department of Natural Resources (DNR) will now have more authority to offer negotiated timber sales. Negotiated sales, rather than competitively bid sales, will allow DNR to tailor timber sales in areas of the state that are actively managed for forestry and where there is high demand for timber products or biomass fuel. It is important to note that any negotiated timber sale is still subject to the constitutional sustained yield principle and also subject to a best interest finding by the Commissioner of DNR. SB 32 was introduced by the Governor at the request of the DNR. While the bill was shepherded through the legislative process by DNR officials, my office closely monitored its progress and we met with legislators and their staffs to explain the benefits to the state and local economies. We all know the federal government (U.S. Forest Service) has struggled to provide an adequate supply of timber for our local lumber mills. I’m grateful that the State of Alaska is stepping in to partially fill that void. I believe this new law will maintain and boost the local timber jobs in Southeast. I am proud to have worked alongside Governor Walker and DNR to provide more opportunity for our timber industry. 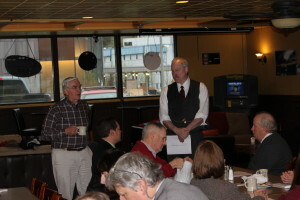 On Friday morning April 8th, I was invited to speak to the members of the Juneau Chapter of the Alaska Miners Association. It was a great opportunity to update the members on the status and opportunities forthcoming with several Southeast road projects that my office was instrumental in securing funding for and moving forward. I also spoke about pending legislation and my perspective on the State’s fiscal situation. Senator Stedman pictured here with Jim Clark. My general focus during my tenure has been on seeking opportunities for local jobs and economic development in Southeast. Progress on access to lands provides opportunity for federal and state timber sales, quarry extraction, and mining and milling operation and is positive news for our region. I have also supported funding for preliminary mapping of possible road corridors using LIDAR technology to assist the design and permitting of our roads. It is definitely positive news for our region. The Vallenar Bay Road Project (https://aws.state.ak.us/OnlinePublicNotices/Notices/View.aspx?id=180885) on Gravina Island is moving forward and was placed out to bid on March 31st. The project starts just north of the Ketchikan International Airport and follows the Tongass Narrows north then turns west towards Vallenar Bay. There are 8.4 of new road construction and 1.1 miles of reconstruction. This $5 million project is one of the Roads-To-Resources projects I placed in the 2012 Capital Budget. Thanks again to Governor Walker and the Department of Natural Resources for making this project a priority and performing the necessary work to get this project out to bid. As employment in several sectors of our economy declines, it is incredibly important to continue moving projects over the finish line to generate local jobs and economic development. It is a great privilege to work alongside Governor Walker to encourage the development of Alaska’s renewable resources.